MS student Nelson Tull won First Place in the Student Poster Competition at the EWC Research Symposium. Nelson described his research to enhance resolution of coastal flooding forecasts for decision support. PhD student Ajimon Thomas won Honorable Mention. Ajimon described his research to quantify interactions between tides and storm surge along the U.S. southeast coast during Hurricane Matthew. 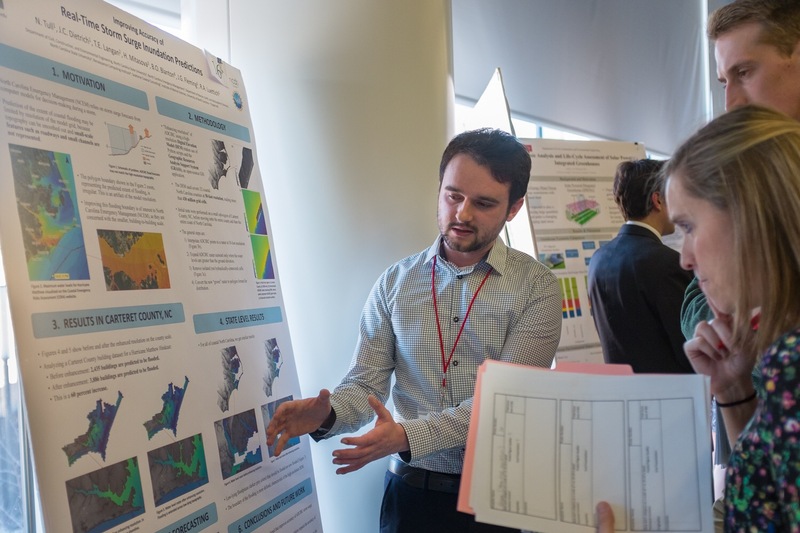 This event is an annual showcase for research in our Environmental, Water Resources, and Coastal (EWC) engineering group, as well as a recruiting event for potential students. Awardees are selected by judges from other academic departments, government agencies, and consulting firms. Students presented their posters to judges and visitors during a poster session, and then finalists presented orally to the entire audience. Congratulations to Nelson and Ajimon! Nelson Tull shares his poster with judges at the 2018 EWC Research Symposium.